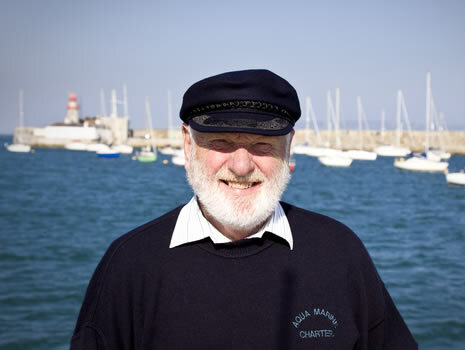 Aquamarine Charter has been in business for 25 years with its skipper Jeff having over 55 years experience in handling motor cruisers around Dublin Bay and further afield. Aquamarine charter boat "Beluga" was named after the small white beluga whale. The boat has a large saloon with large windows giving a panoramic view. An all electric galley is forward of the saloon. After departure you can join the skipper on the flybridge which is 14 ft above the water line giving excellent viewing. A boat trip along the coast to the south side entails leaving the lovely granite walled piers of Dun Laoghaire harbour built between 1817 and 1842. After passing the two lighthouses we proceed through Scotsman Bay, passing Bulloch Harbour and on down through Dalkey Sound which is between Dalkey Island and the mainland. We then enter into Killiney Bay which is locally known as the Irish Bay of Naples. Continuing south we pass Bray head which has not changed over the centuries with the exception of the single line railway. At the end of Bray Head, Greystones comes into sight which is the most southerly point of our trip. A new marina has been built in Greystones which now gives us a new port of call. North of Dun Laoghaire a trip can include calling to the port of Dublin which is on the river Liffey, we can go up the river as far as the East Link Bridge and then back down again entering into Dublin Bay travelling towards the Baily Lighthouse on Howth Head. Once passed the Nose of Howth the tiny island called Irelands Eye which is a bird sanctuary comes into view. If the tide is right we can call into Malahide which has many eating houses. We return via Howth Harbour which has a fishing fleet and marina together with some good restaurants. The final journey will take us back across Dublin Bay to Dun Laoghaire. We can of course cater for your individual needs and work with you to ensure that the schedule meets your requirements. Should you have any queries give your skipper Jeff a call on 00353(0)872574997. 11 Beechcourt, Killiney, Co. Dublin, A96 FP68, Ireland.